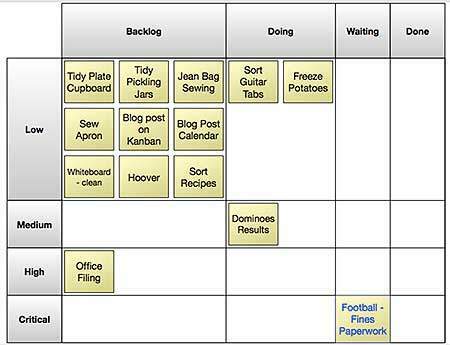 You may have seen in Friday’s Weekly Round Up post that I had decided to talk about “Kanban” this week, the reason being that it’s been featured a bit in the productivity blogs I read recently and peaked my interest. 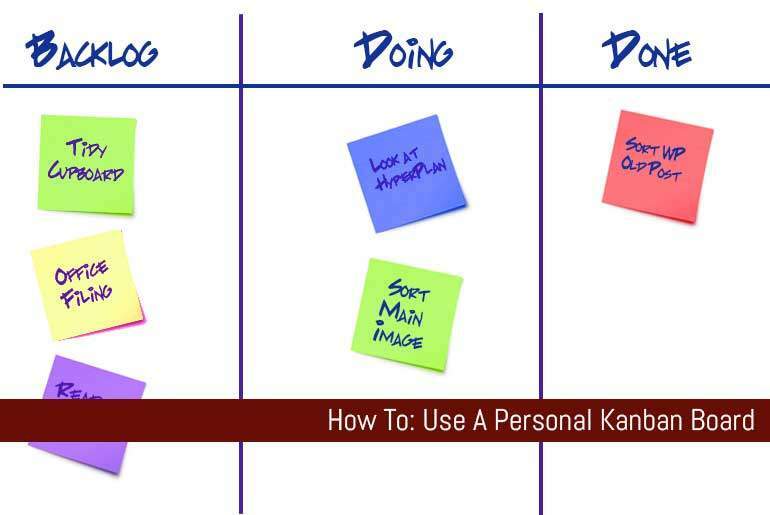 Depending on what you look at Kanban means “Sign board” or “Card you Can See” either way it’s a visual tool to help you determine what needs to be done, what’s being done and what is done. Kanban originally started as a process within Toyota so that everyone from shop floor workers to supervisors to the board of directors could see what was being done, it was the precursor of the “Just-In-Time” manufacturing system that we’re so used to seeing today1. Basically, Kanban stops wastage in terms of time, energy and resources and allows you to concentrate on what needs to be done rather than what you think needs to be done. This is called your “Value Stream” – the steps that are important to you in order to achieve your goals. Items start off in the “Backlog” section, move to the “Doing” section when they’re being looked at/actioned and when the process is complete, they move to the “Done” section. You may find however that, depending on the project you’re working on or the way you work yourself, you may need to rename columns or add additional ones in order to fit in with your workflow. The links below are affiliate links. By clicking on these links you will not be charged any extra for purchasing goods and services from our preferred partners however flippingheck.com may receive financial compensation which contributes to the running of the site. Some people just use the top of their desk, others a whiteboard with pens, a whiteboard with post-its or they buy a purpose-built Kanban board2, you may even want to try software3. Whatever you chose, your system needs to be flexible enough for you to use it where you need the most (office, home, portable) and easy enough for you to feel comfortable updating it regularly – there’s no point in setting this up and then not using it again. 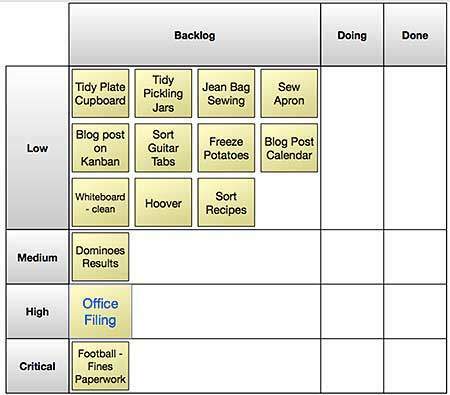 The first step of setting up your Kanban is to dump all of your outstanding tasks out into the “Backlog” column. This is a major principle of all productivity techniques – everything needs to be emptied out of that big ole head of yours onto your Kanban so you can then evaluate what needs to be done. Sometimes you won’t need to prioritise anything, all tasks can be created equal despite what they say. That being said, if you have some pressing tasks, prioritise everything now before you get started – it’ll help you to figure out what to focus on later. You might only need two categories, for example “Whenever” and “Now” or you may need something a bit more granular such as “Low”, “Medium”, “High” and even “Critical”. 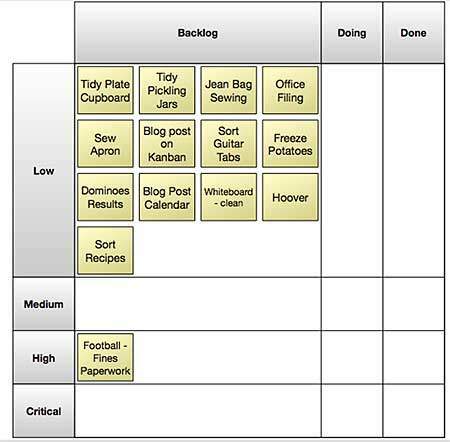 Don’t worry too much about at it at this stage though however, the whole idea of Kanban is that it’s flexible and can quickly adapt to your needs. A “W.I.P” limit is your “Work In Progress” limit, that is the number of tasks you feel comfortable working on at any one time. If you have a lot of bigger tasks, you may set this to one. If you have a lot of smaller tasks, you may set this to three. The maximum recommended number though is 5 as any more may split your attention too much and you’ll lose focus. Pull is where you move a task from one stage to another. After your initial brain-dump you may realise that you’ve started some tasks already so move them to the “Doing” column. Perhaps you’ve written something down that you now realise is completed so stick that in the “Done” column. Carry on going, but remember you can only have the maximum number in the “Doing” column as specified by your “W.I.P” limit. You may realise that there are items in your “Doing” column that you are waiting for other people’s action or input on. You may not want to move these back to the “Backlog” column as you’ve already started them so you may need to add another column such as “Waiting For”. This makes sense as it frees up space in the “Doing” column for another item, just remember that when your “Waiting For” items becomes a “Doing” item, you can only add it if you haven’t reached your “W.I.P” limit. And celebrate the fact that there’s another item “crossed” off your to-do list, apparently this frees up our brains to concentrate on even more episodes of the Walking Dead, or Real Housewives or something4. You can use the columns to keep an eye on the progress of certain tasks. Is there one thing that seems to be stuck in the “doing” column? Why do you think this is? Perhaps it’s something that needs to be broken down into smaller tasks in order for it to be successfully completed, maybe it needs to be passed over to a different person or department. Regularly review what’s in your “Doing” column to determine bottle-necks, areas for improvement, items that are not really your responsibility or those that need breaking down into finer tasks. If you’re a proponent of Stephen Covey’s “7 Habits Of Highly Effective People*”, the Kanban technique fits in really well with Covey’s third habit “Put First Things First”, and by extension this sits neatly with the new “5 Choices” that focus on Covey’s teachings. The more I think about this system and its simplicity and flexibility, I can’t understand why it hasn’t taken off a bit more that it has. It’s so much simpler than David Allen’s “Getting Things Done”, a bit more of a fully fledged system than writing simple to-do lists of items, and a certainly a lot more motivating. 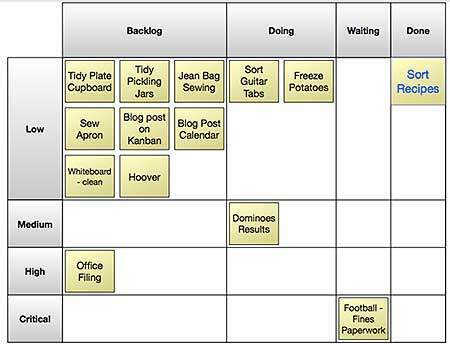 Kanban also fits in with most existing productivity systems though so it’s an excellent choice for someone already using a productivity system and someone looking to start using one for the first time. I am tempted to start using this method, my one worry is portability. I work different types of jobs, in different locations (some with no access to a smart phone or internet, only paper) so any system I set up needs to fit in across these different types of scenarios. Yes, I’m an odd one! Most people work in one job – or at least one job sector – and if that’s the case I’d really recommend looking into this as a system. As for me, I think I’ll definitely use it for my personal web projects and there’s post coming on Wednesday describing how I’ll use Kanban with web development you lucky people! You might also try making your “Backlog” column an “Options” column. Just like the ToDo List weighs heavy on people, so does the word Backlog. While we did use Ready or Backlog in the Personal Kanban book, we’ve largely switched to Options which underscores that people have some freedom in deciding what to pull and when. I *love* the idea of an options column, It make the whole process a bit more freeing and lends itself to less guilt than a backlog column which implies you’ve been unproductive and have gone off schedule. I’ll look at updating the article. Cool! 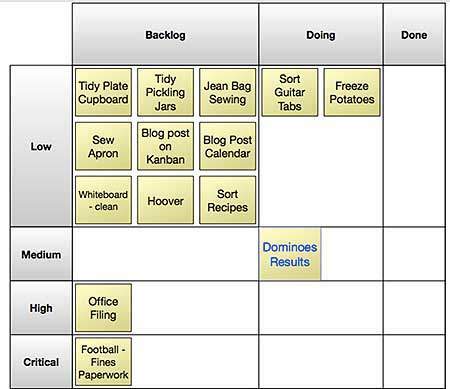 Easy to understand and useful out of the Kanban articles I’ve read. Thank you Katy and thanks to Jim for adding the idea.